✶ Want to adjust a column of text to the right or left? Click on the header row and drag the column where you want. Click here for an animated GIF showing the process. Of the twenty-four books of the Hebrew Bible, twenty-one use the same grammatical system of cantillation. For Ashkenazim this system is very familiar – the Torah, Haftarah, and Five Megillot all share the same basic grammar, as well as the books of Ezra/Nehemiah, Chronicles, and Daniel (for which the creator previously developed a system). But the books of Job (Iyov), Proverbs (Mishlei), and Psalms (Tehillim), sometimes known by their initials as the EMe”T books, don’t follow this grammar. For Ashkenazim, the cantillation of these three books can look alien – a trope system that doesn’t seem to follow what a trope system should. Some Mizraḥi groups, like the Syrians of Aleppo, have preserved a system to chant the EMe”T books. But these systems use distinctly Mizraḥi terminology for many of the te’amim, and their musical forms often make use of quarter tones and other distinctions that can be confusing to the Ashkenazi ear, more acquainted with the European 12-tone musical tradition than the modal maqāmāt of the Islamic world. These three systems were developed as a cantillation system for the EMe”T books in an Ashkenazi style, meant to be more accessible for Ashkenazim than the Syrian systems. Some of the cantillation marks’ names were changed to make them sound more “Ashkenaz-ish” (for instance, the form ֗א֝א was renamed from “geresh mukdam” to “r’vi’i v’azla” as a parallel for the Ashkenazi 21-book form “kadma v’azla”). The tonality, though using distinctly modal sounds as does much Ashkenazi trope, sticks to a 12-tone system, avoiding the quarter-tones and modal cadences unconventional to the European musical ear. Because the EMe”T books are so distinct in meaning, three systems were developed for the three different books. Psalms, which plays a disproportionate role in our liturgy, is in a major key, paralleling the major key of Torah readings throughout Ashkenaz while adding a more celebratory tone befitting Psalms. Proverbs, a book of guidance and advice, is brief and minor, but not alienating, meant to be accessible and giving an air of understanding. And Job, which one could easily claim to be the most discomforting book of the entire Bible, is a lament, slow and mournful, going the furthest from standard tonality through half-tone distinctions, and incorporating melodic content from the High Holy Days (a time often associated with Job in days of old as well as today). These systems could be used during public readings (perhaps of the creator’s calendrical systems for weekly or yearly psalms), or just used in personal study as a way to gain greater access to the grammatical nuances and complexities of these amazing books. 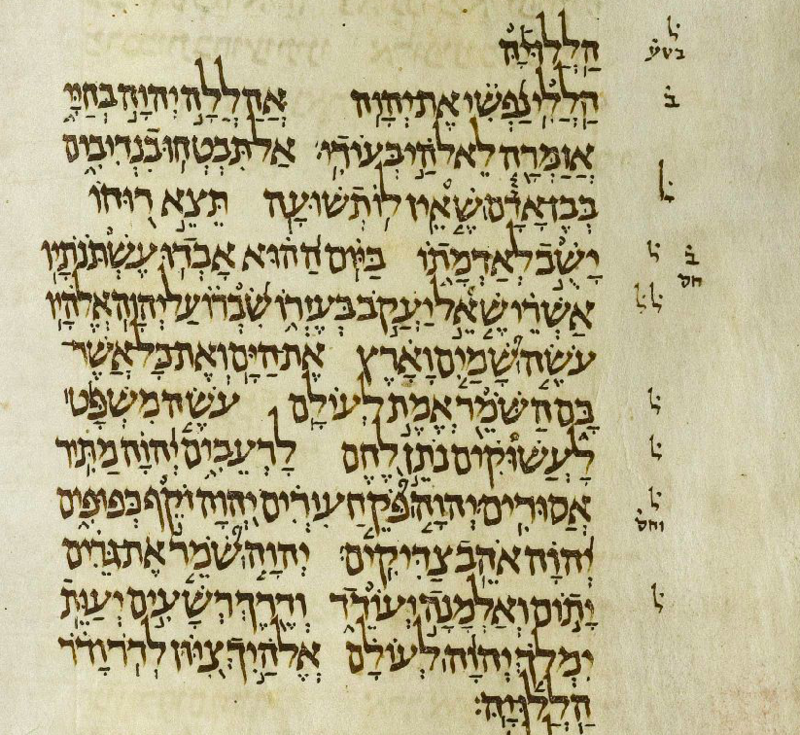 “An Ashkenazi-style Cantillation System for Psalms, by Isaac Gantwerk Mayer” is shared by Isaac Gantwerk Mayer with a Creative Commons Attribution-ShareAlike 4.0 International copyleft license. From a family of musicians, Isaac Gantwerk Mayer believes that creative art is one of the most powerful ways to get in touch with the divine. He composes music and poetry in Hebrew and English. Isaac runs a Jewish music transcription service, which will transcribe and set any Jewish music in any language, recorded or written. Contact his service on Facebook or via his music blog. Please reciprocate for any adaptation or redistribution of this work by (1) properly attributing the work to Isaac Gantwerk Mayer, (2) clearly indicating the date you accessed the resource and whether any changes have been made (and if so, please be in touch with us and leave a comment below so that we might note your adaptation or improvement), (3) providing a link back to this source, and (4) specifying the Creative Commons Attribution-ShareAlike (CC BY-SA) 4.0 International copyleft license under which this work was shared. 2018-08-23 – 13 Elul 5778 at 10:40 pm · Reply. Two little corrections – second recording here has pages 2-8. Also, on page one, you have written shalshelet ketanah but in the recording you call it shalshelet gedolah. Two questions: Why is a Zarqa here called a Tzinur? Why a galgal and not a yerach ben yomo? Do the latter look slightly different, I can’t quite tell. 2018-08-24 – 13 Elul 5778 at 10:20 am · Reply. Sorry about the mixups there. A tzinor is different from a zarqa – whereas a zarqa hangs off the end of the last letter, a tzinor is directly over the accented letter. Though they look similar they are not the same trope. Regarding galgal and yerach-ben-yomo, those are usually considered the same trope, but since galgal is pretty common in the EMe”T books I kept the shorter name.